The Alley Theatre produces 400 performances annually, more than all other performing arts organizations in the Theater District combined. 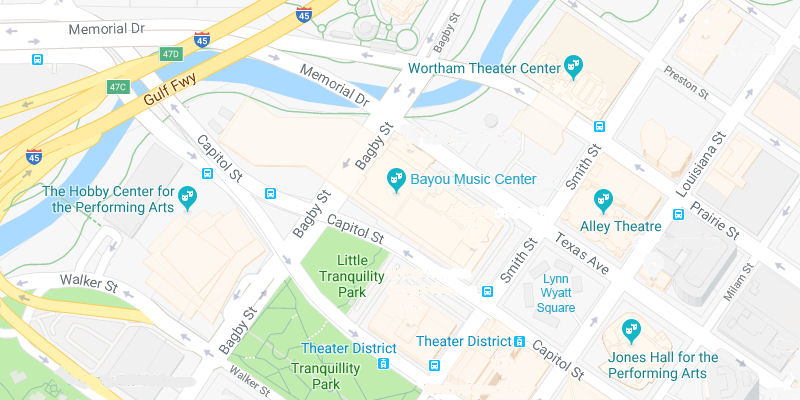 The Alley has attracted over 8 million people to Houston’s Theater District since 1968 and has a $34.5 million annual economic impact on the City of Houston. 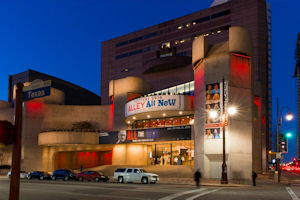 The Alley Theatre, one of America’s leading not-for-profit theatres, is a nationally recognized performing arts company focused on collaborating with resident actors, visiting artists, directors, designers, dramaturgs, and authors to cultivate the new voices, new work, and new artists of the American theatre. A staff of 177 is under the direction of Artistic Director Gregory Boyd and Managing Director Dean R. Gladden. The Alley has also brought its productions to 40 American cities, and to Berlin, Paris, St. Petersburg and New York’s Lincoln Center, as well as to major European festivals (including two in one season at the Venice Biennale) and Broadway. A recipient of the Special Tony Award for Outstanding Regional Theatre, the Alley creates a wide-ranging repertoire and innovative productions of classics, neglected modern plays, and premieres, as well as new works developed through the Alley’s new play initiative. One couple. Infinite possibilities. Science and romance collide in this spellbinding play that imagines what happens when boy meets girl. And when boy meets girl again. And again. Defying the boundaries of the world we think we know, Constellations delves into the universal truth of finding and losing love and questions the difference between choice and destiny. Agatha Christie’s Murder on the Orient Express is a plot-twist masterpiece that has thrilled mystery lovers from television, radio, and film. And now you have the chance to experience this lush mystery live onstage. Playwright Ken Ludwig (The Three Musketeers) adapts the classic thriller that features renowned detective Hercule Poirot and a cast of characters sure to have everyone in the audience guessing just who did it. Don’t miss your shot at being at the scene of this masterpiece crime ExxonMobil’s Summer Chills™. This whimsical tale of romance, tragedy, and comedy will take center stage in familiar places for Alley audiences. Set in Texas, this magical tale will be seen through the imaginative eyes of a young, Houstonian child. This play is a sweeping story of wrath and redemption and of lost and then found love. The Resident Acting Company will join together to tell Shakespeare’s beloved fable of hard-won joy and the promise of renewal. It’s 1975. Saigon has fallen. He lost his wife. She lost her fiancé. But now in America, a strange new land of cowboys, hippies, and bikers, these two Vietnamese refugees just might find each other. Remixing history and culture into a funny and energetic fantasia, playwright Qui Nguyen creates a contemporary twist on the boy meets girl story that The New York Times hails as “a raucous, immensely moving comedy.” Using his irreverent, infectious style, Nguyen takes audiences on a hilariously rip-roaring ride across 1970s America with a hot soundtrack that serves up hip-hop, sass, and revolution. A Christmas Carol - A Ghost Story of Christmas is a family-friendly re-telling of Charles Dickens’ classic story, which follows Ebenezer Scrooge’s journey with the three ghostly spirits who visit him on Christmas Eve. A Christmas Carol instills a powerful message about redemption and the spirit of the holiday season. The fifth annual Alley All New Festival features new plays from some of the most exciting voices in contemporary theatre. All Alley All New workshop performances and readings are free and open to the public. Festival packages featuring prime seating, parties with festival artists and meals between performances, will be available for purchase in May. Directed by Austin, Texas-based KJ Sanchez and starring “Sesame Street’s” Emilio Delgado, Quixote Nuevo by celebrated playwright Octavio Solis is an inspiring reimagining of Cervantes’ Don Quixote. Set in a fictional modern-day Texas border town, Quixote and his recruited sidekick embark on an adventure in search of long-lost love. Infused with imagination, Tejano music, and true Texas soul, Quixote Nuevo shows the challenges of living in this modern world all the while in pursuit of a lost dream. The play is a co-production with Hartford Stage and Huntington Theater Company. From the Texas playwright of the world premiere Alley hit Cleo. Pulitzer Prize winner Lawrence Wright, author of God Save Texas and The Looming Tower: Al-Qaeda and the Road to 9/11, offers a behind-the-scenes look at a historical moment whose legacy continues to resonate 41 years later. In the tumultuous 1970s, Middle East peace seemed nearly as impossible as it does today. Yet during 13 days in 1978, Israeli Prime Minister Menachem Begin and Egyptian President Anwar Sadat, with the powerful help of U.S. President Jimmy Carter and First Lady Rosalynn Carter, hammered out an agreement that inspired the entire world. Wright’s play is filled with humor, insights, and a view towards hope. Based on George Orwell’s futuristic novel, 1984 brings us the story of Winston Smith and a stark vision of a world in which freedom of action, word, and thought are controlled by Big Brother. As the story of Winston’s fight for individual identity unfolds, the vision grows increasingly terrifying as the world it depicts grows uncomfortably familiar. How far are we from realizing Orwell’s nightmare? Are we already there? Can there be more than one truth, more than one set of facts? A ferocious and provocative adaptation of one of the most prescient works of literature of the last century. Developed as part of the 2019 Alley All New Festival. Jeff Browning, a new father desperate for community, casually follows his buddy’s advice and tries to join a white supremacist group … but the results of his ancestry test prove surprising. Amerikin follows Jeff as serious consequences come knocking and the line between "us" and "them" gets incredibly blurry.